Aztec civilisation was established by the Nahuatl-speaking Mexica people who migrated from the north and established their city-state Tenochtitlan on the swampy grounds of Lake Texcoco in 1325. With the passage of time, the civilization developed a rich culture which was in part influenced by the classical Mesoamerican civilizations. Aztec religion was a polytheistic set of beliefs with rich mythology including the myths of creation, myths about the end of time, and myths about different aspects of nature. The most famous myth in Aztec mythology is of course the creation myth which describes how the world was created. According to this myth, at the beginning was the dual god Ometecuhtli/Omecihuatl who had four children named Huizilopochtli, Quetzalcoatl, Tezcatlipoca, and Xipe Totec. The universe created as result of war between these four children and the sea monster, Cipactli. There were 13 heavens with the each created in the middle. Huitzilopochtli the Principal Aztec God – Aztec mythology and rituals were closely related with each other. For instance, one of the most famous Aztec rituals was human sacrifice and it was related to a specific Aztec myth. Aztec mythology and rituals were closely related with each other. For instance, one of the most famous Aztec rituals was human sacrifice and it was related to a specific Aztec myth. According to this myth, the sun god Huitzilopochtli constantly needed blood in order to continue the cycle of sun and thus human sacrifice was offered to retain this cycle. Similarly, according to Aztec mythology, the moon and the stars were at constant battle with the sun and the sun god needed human sacrifice in order to win the battle against them. Aztec deities had close relation with Aztec mythology and one or more myths were related to almost every god. Thus, other than the famous myths related to the sun god Huitzilopochtli, the Aztec god Tezcatlipoca was the god of sorcery and wars and according to Aztec mythology, it was this god who started all wars. Similarly, another god Camaxtli was also the god of war, hunting, fire, and fate. According to Aztec mythology, this god invented fire and made the earth. It was also this god who led the warriors slain in the battle to the eastern sky where they became stars. In Aztec mythology, Chalciuhtlicue was the Aztec deity of water and all the water sources. She was also the patroness of childbirth. According to Aztec mythology, Chalciuhtlicue was the wife of the rain god, Tlaloc, and mother of Tecciztecatl, the Aztec moon god. Aztecs associated womb with waters and therefore Chalciuhtlicue was also associated with fertility. Aztecs also believed that Chalciuhtlicue helps the rain god, Tlaloc, rule the paradise kingdom of Tlalocan and it was also she who brought fertility to crops and protected children and women. In Aztec mythology, Xiuhtecuhtli was the god of fire, day, and heat. He was also represented as Xiuhcoatl which was a mythological serpent. 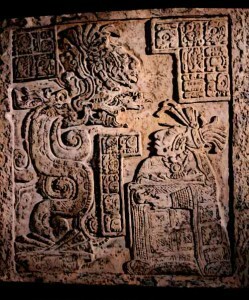 According to Aztec mythology, Xiuhtecuhtli provided warmth in cold, provided light in darkness, and food during famine. He was the husband of Chalchiuhtlicue and was also considered a manifestation of Aztec dual god, Ometecuhtli. Various stone statues of Xiuhtecuhtli have been discovered during excavations at the Great Temple of Tenochtitlan. 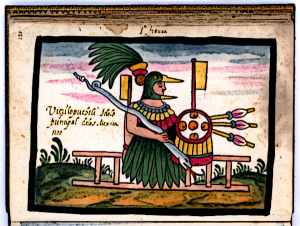 Aztecs had a variety of gods for different objects in the sky. Thus for instance, in Aztec mythology, Citlalincue was the god of the Milky Way. Additionally, there were 400 gods of northern stars who were collectively known as Centzonmimixcoa and another 400 gods of southern stars who were known as Centzonuitznahua. The god of male stars was named Citlaltonac while the goddess of female stars was called Citlalmina. According to Aztec mythology, Tezcatlipoca was the god of the night sky, the night winds, and a variety of other concepts. He was one of the most important and powerful gods in Aztec pantheon and many temples were built for his worship. A variety of rituals were reserved for him and priests donned specific kinds of garments during his worship. Another Aztec deity who was also the goddess of night, astrology, and calendar was Oxomoco. Just like night, there were multiple gods associated with day in Aztec mythology. One of the most powerful Aztec gods, Xiuhtecuhtli, was also the god of fire, day, and heat. Temples were built in his honor and festivals were a regular feature of Aztec calendar. In Aztec mythology, Cipactonal was also the god of the day sky and together with the goddess of the night sky, Oxocomo, formed the first human couple. Other than that, since Aztecs believed that there were 13 heavens, there were 13 different gods associated with these heavens. In Aztec mythology, Tlaltecuhtli was the name of the earth goddess who had both feminine and masculine attributes. According to Aztec mythology, Tlaltecuhtli came into clash with Quetzalcoatl and Tezcatlipoca during the creation of the world and was torn into two parts. Her upper part became earth, mountains, and rivers, her hair became trees and flowers, and her eyes became caves and wells. But the earth goddess also needed tribute in the form of human blood to keep producing for the needs of humans. Thus human sacrifice was offered in her honor. Chimalma in Aztec mythology was the mother of Aztec god Quetzalocatl. She was also the spirit who accompanied the Azteca from the homeland of Aztlan. In Aztec art, she is represented as a feathered serpent. The other Aztec matron goddess, Coatlicue, was the mother of Aztec god of sun and war, Huitzilopochtli. According to Aztec mythology, she also gave birth to moon and stars and was patron of the women who died in childbirth. The Aztecs had a polytheistic system of beliefs and thus a rich mythology associated with a variety of gods. Some of these gods were more powerful than others and large temples were constructed for their worship. Each god or goddess had a specific aspect of nature under his or her control and the nature of the sacrifice offered to them depended on the kind of powers they had. With the expansion of the Aztec Empire, gods and goddesses from other city-states were also included in the Aztec pantheon.